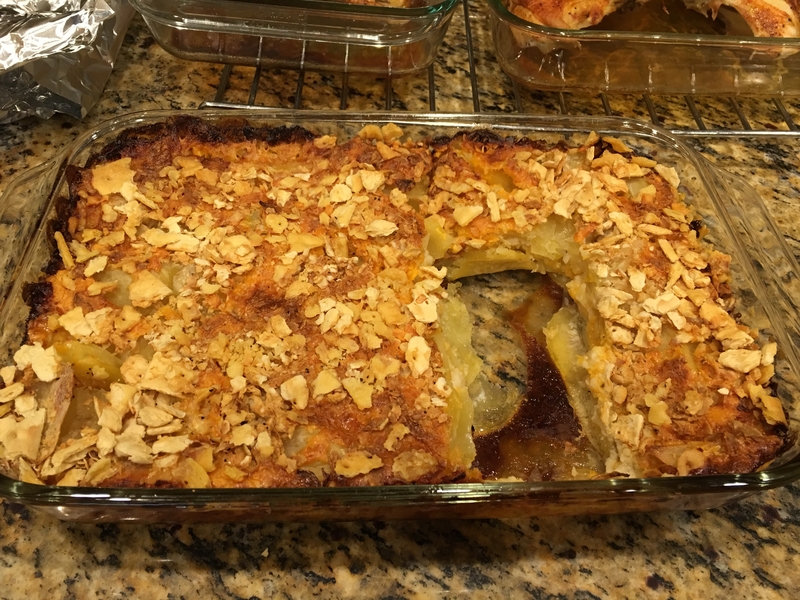 A Nice Potatoes Au Gratin Serving! Au Gratin Potatoes! This is an old family recipe that is now being requested by our Grandchildren. 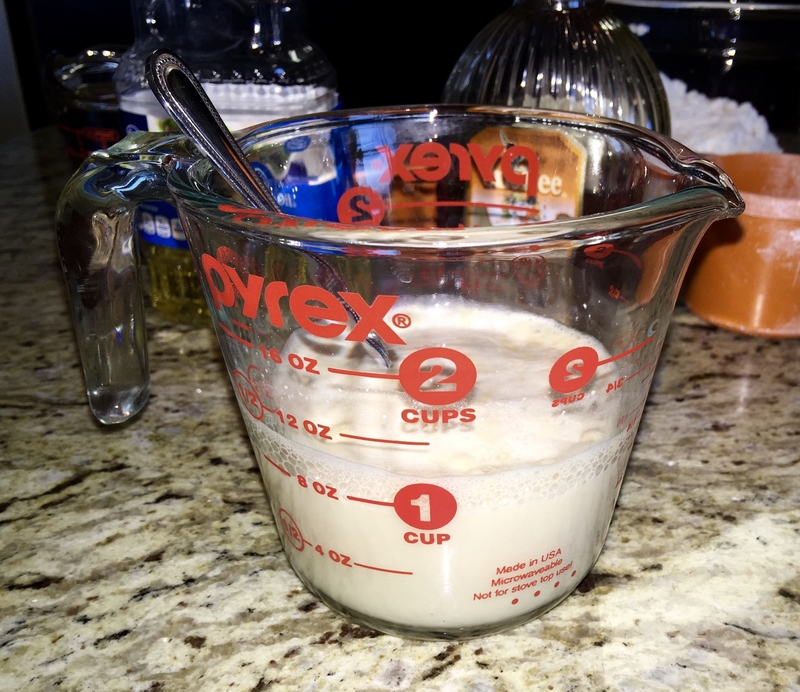 This is a freestyle recipe so you can adjust the ingredient quantities depending on the size of the glass baking dish you use and how many people you are attempting to feed. This is a layered recipe so you can adjust the number of layers, again depending on how deep your glass baking dish happens to be. We would suggest cooking at lease one medium to large potato for each person. We will add photos to the blog as we get them. Olive oil, vegetable oil or butter – to grease the bottom of the pan. Whole potatoes – sliced about as thinly as you can get. 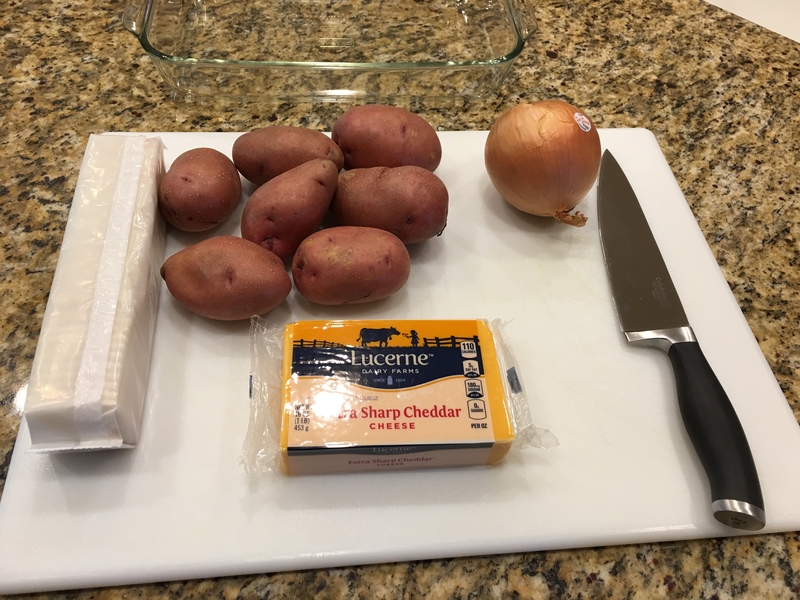 Any type of potato will do (Red, Russet, Yukon Gold, etc.) We prefer red. The potatoes can be peeled or not, but generally we peel the potatoes. Putting together the first layer. 2) On the bottom of the pan lay 3-4 layers of the sliced potatoes. 3) Next add a thin layer of diced onions. 4) Add a layer of grated cheddar cheese thin enough so you can see through the layer. Now that you have completed one layer, you just need to repeat 3-4 layers or more until your pan is at least half way full. When you are finished with your layers, add enough milk so that it submerges at least 1/3 of the bottom layers. 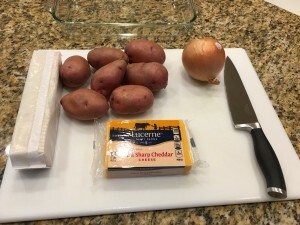 The milk adds moisture and creaminess to the potatoes. Add the milk slowly in dribbles all over the top so that the cheese and crackers meld together, which will form a nice crust. Bake at 325 degrees for about 2 hours. It takes a while for the potatoes in the middle to get done. You can test with a fork in the middle to see if it is done. The fork should go through the potatoes without any resistance. Southern state food plots work differently than northern state food plots. When we say southern states, we mean south of the Mason Dixon Line, including but not limited to North and South Carolina, Georgia, Alabama, Mississippi and Louisiana. 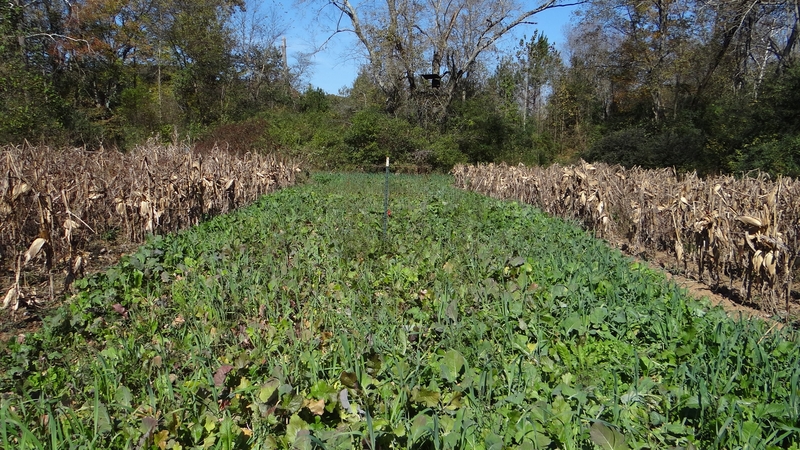 One of the main differences in southern food plots is how forage crops are grown and established as annuals and not as perennials. In the northern states clover, alfalfa, chicory and a few other species can be established as perennial multi-year crops. 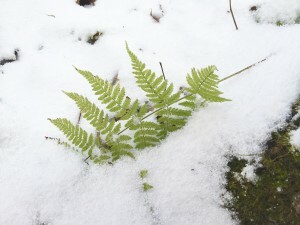 The main reason southern perennials are hard to establish is an extended period of hot weather throughout the summer and many times accompanied by periods of drought. 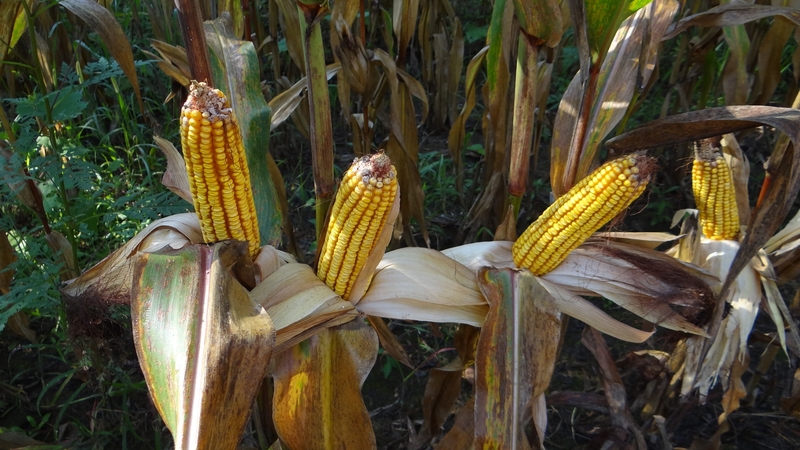 One of the staples of southern food plots is grain corn which is grown and left standing for the deer to feed on throughout the fall, winter, and sometimes into early spring. One of the most common summer annual deer food plot crops are soybeans. Deer like soybeans so much that many times they need to be replanted because the deer have eaten them down to the ground. 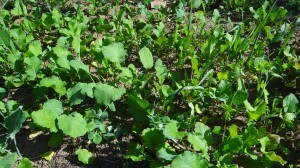 That is what happened in these food plots. 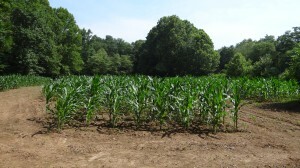 In this field the food plots have been set up in alternating 12 rows of corn and 12 rows of soybeans. This makes a nice combination of cover for the deer and the availability of both grain and annual forb foliage. We use the term forb as a word to describe a variety of wild and cultivated flowering and foliage plants that the deer browse on throughout the year. 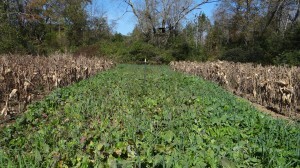 In the Fall, Cool Season Brassicas, Clover, Chicory, Triticale, Turnips & Peas are planted to replace the soybeans. The soil is prepared and the seed is planted sometime between Sept. and November depending on how far south. In the cool moist weather of a normal Fall, the seeds will germinate nicely and then establish themselves into an attractive food plot. The variety of species will be tempting to the deer throughout the Fall, Winter, Spring, and early Summer. 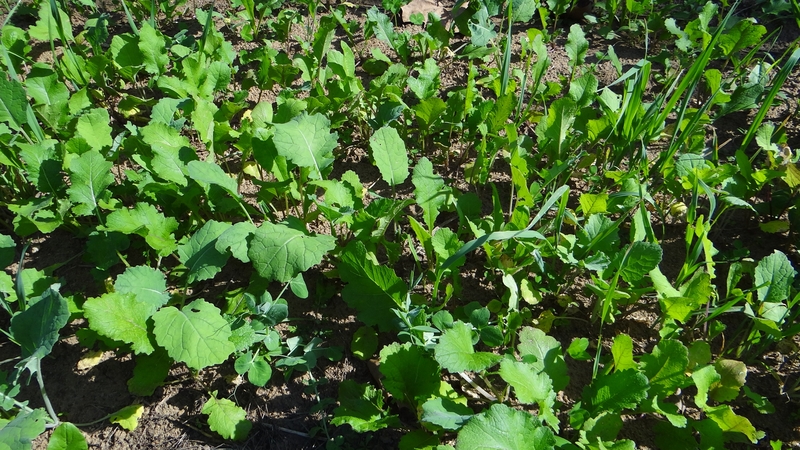 The triticale, clover, chicory and peas will be immediately available and the brassicas and turnips will be preferred after a frost or two when they become sweeter. 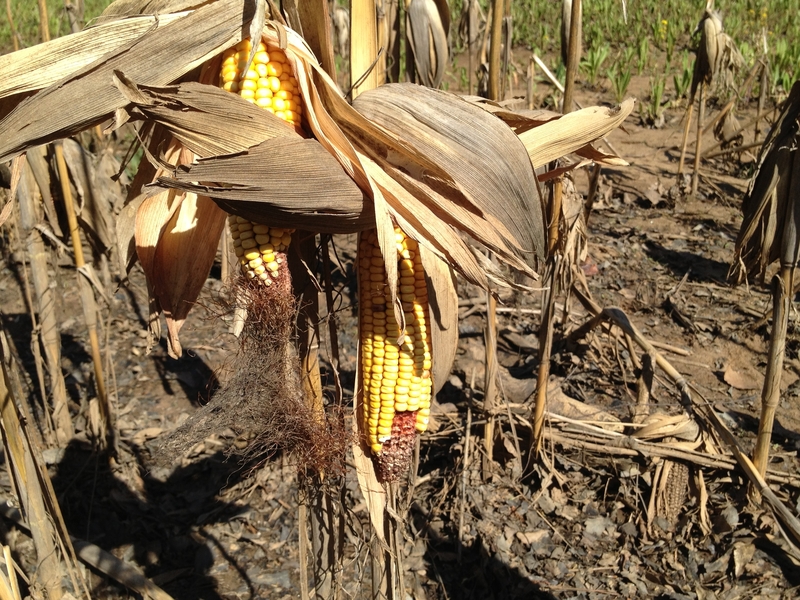 By this time the grain corn has dried and will be preserved throughout the winter as long as it stays on the stalk and off the ground. 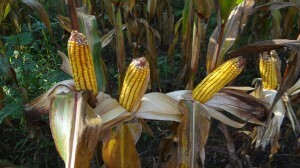 The deer will get in a habit of feeding on this grain corn. If there are any squirrels around, they will help pull it off the stalk. The combination of the grain corn and forbs, in alternating cover and open areas, surrounded by trees and brush, and nearby water, make this an almost irresistible place to feed and bed down. Trail cams record the plot visitations and help determine what deer are frequenting the plot, when and how often. 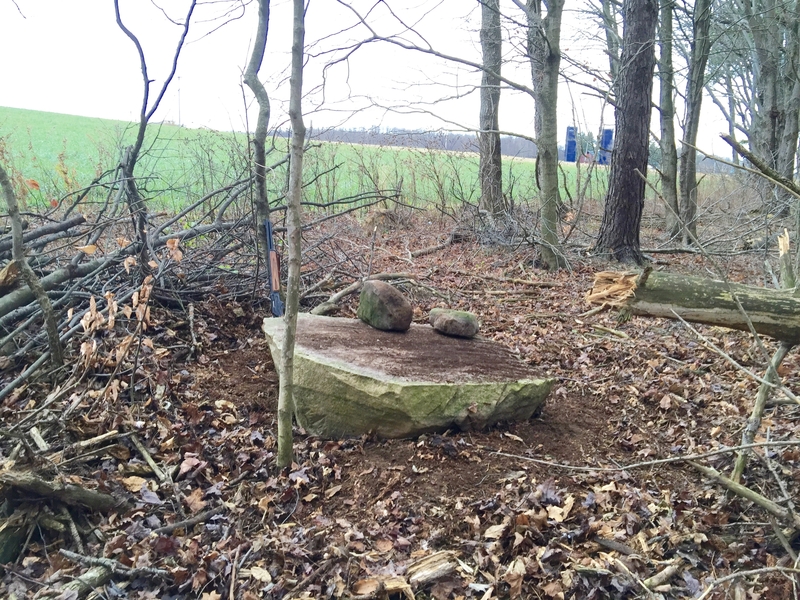 As the plot further matures into archery, crossbow, gun, and muzzleloader seasons, the plot is ready for the hunt. In this case a camouflaged stand has been erected in the tree at the back edge of the plot and will provide countless hours of enjoyment, quiet wildlife observation, and an opportunity for a successful hunt. 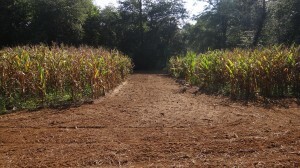 Established Food Plot Ready for the Hunt! After the hunting season is complete, the plots will continue to be available to pregnant does, maturing young bucks and last years fawns. The food plots contribute to the overall health of the local deer herd by providing a year around source of high quality forage for the deer. 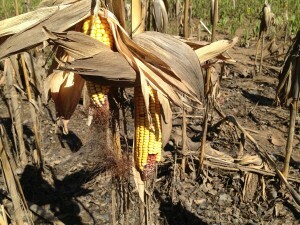 Corn Ears Still on the Stalk in the Spring! We started adding honey to our pizza dough many years ago when my children were young and as adults they are also making this dough. Now the grandchildren are asking to have the recipe, as well. You remember that we are beekeepers. So here it is!! 3 Cups of Flour (we have made this with a variety of flour types. We prefer white bread flour. 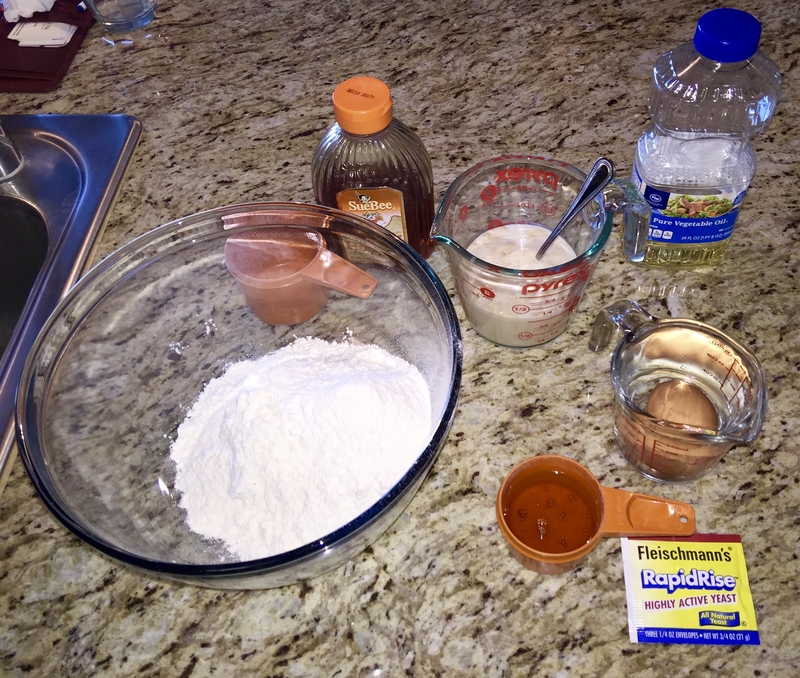 - Add the flour and salt to a large bowl and mix thoroughly. - Combine the cup of warm water, yeast, and sugar, mix and let set to proof. - Place the egg in some warm water so that it can warm up to, at least room temperature, while waiting for the yeast to proof. - In a quarter cup measure first add the 1/8 cup of oil and then add the 1/8 cup of honey. flour until you can easily form it into a nice moist ball. - When you have a ball formed, place a towel over the bowl and set in a warm place. - Let rise for about an hour. (while you are waiting for it to rise, prepare your pizza topping). 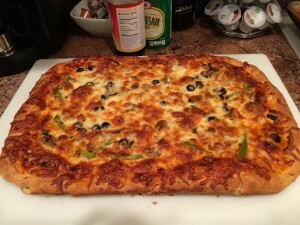 - At this point the dough is ready to spread into your pizza pan. 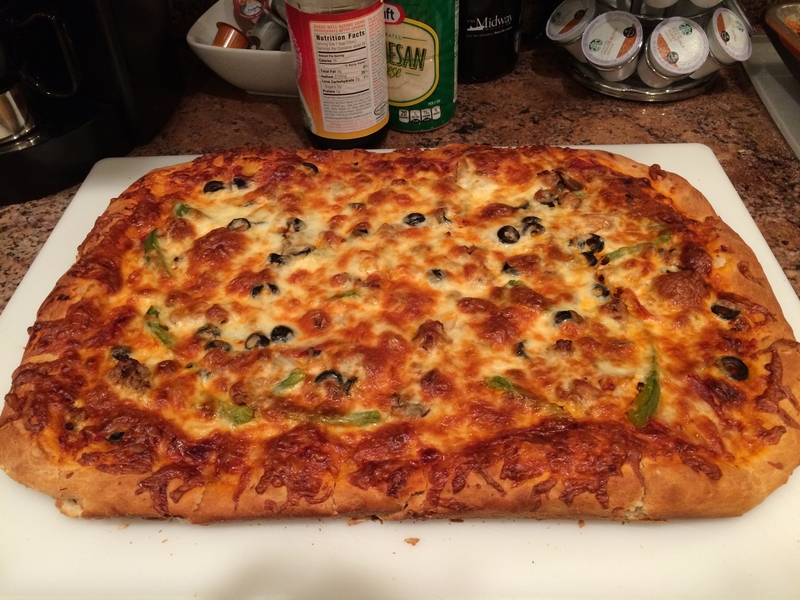 - If you want thin crust, spread it thinly, for thicker crust spread it less thin. 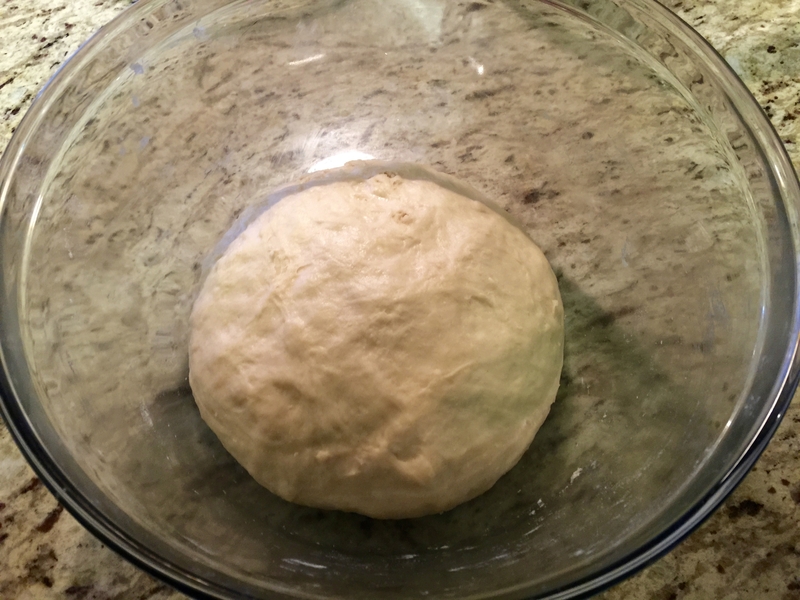 - This dough will make 3 medium thin crust pizzas, two medium thick crust pizzas, or one large pizza. - Preheat your oven to 425 degrees and bake for about 10 minutes. Then check if it is baked to your preference. Proofing – Yeast is a living organism. Proofing is when you allow the yeast to grow to verify that the yeast is alive and will make the dough rise. If the yeast is dead, it will not make the dough rise. The yeast, water, sugar mixture will form a “foam” on top, if the yeast is alive. Oil and Honey do not mix – If you put the oil in the cup first and then the honey, the whole mixture will pour out of the cup without sticking. 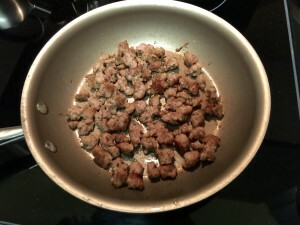 Making homemade Sage Breakfast Sausage and Italian Sausage is easy to make and we prefer it to store bought brands. 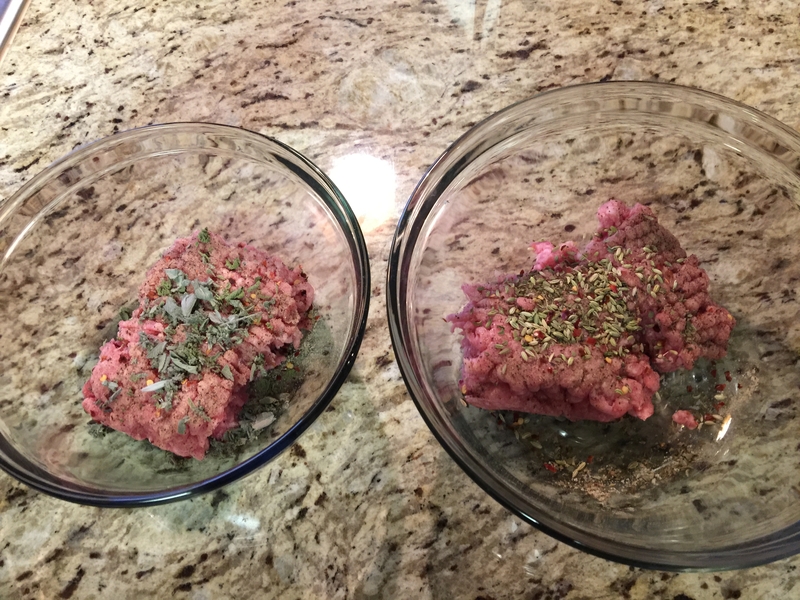 With store bought sausage, the herb mixes vary, so unless you buy the same brand time after time, the different brands vary in flavor. Additionally there is a variance in fat content of the packaged product. When making your own, you can adjust the flavors just the way you want them and have control over the fat content. We find that a lot of brands of italian sausage leave out the whole fennel seeds which we like to have in ours. We grow our own sage, but store bought sage will work just as well. You can make the sausage ahead and freeze it either fresh frozen or cooked frozen. In our local grocery store you can buy 80-20 (80% lean – 20% fat) ground pork. You can also buy lean pork cuts and grind them yourself, if you want something leaner, however you will want some fat content if you want a true sausage flavor. Here is the list of ingredients for both a Sage Breakfast Sausage and an Italian Sausage based on one lb. of sausage. 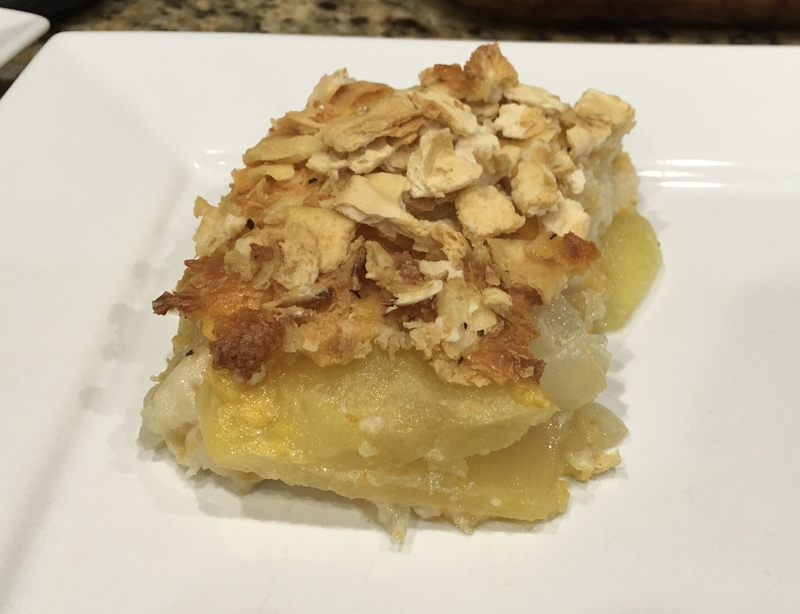 Since this is a freestyle recipe, you can adjust the quantities to your taste. 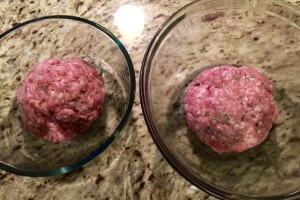 With either recipe the ingredients are uniformly mixed and allowed to sit anywhere from a few minutes to a couple hours to let the flavors infuse into the sausage uniformly (it depends on how big a hurry you are in). When you are ready to cook the sausage, it can be made into various shapes depending on if you want crumbles, patties, sausage links, etc. You can run the sausage through a sausage link stuffer if you are equipped to do that. 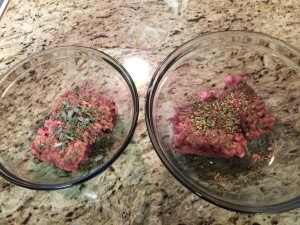 We normally cook the Italian Sausage into crumbles for pizza and the Sage Breakfast Sausage into patties. This hunting season I shot my first whitetail deer with antlers and it turned out to be a nice 10 point buck. I have been deer hunting on and off since I was 16 with probably about 17 years of actual deer hunting. I am 62. We have about a five acre field up behind our barn that is mostly surrounded by a deciduous forest, except for an area of over grown balsam fir Christmas trees. 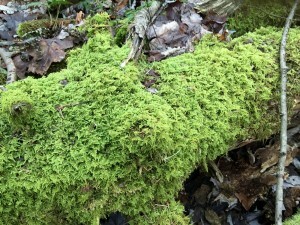 There is a small spring fed pond less than one eighth acre located on the edge of the forest. 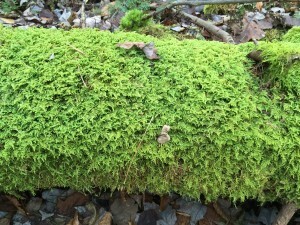 Deer and other wildlife use this as a source of water to drink. 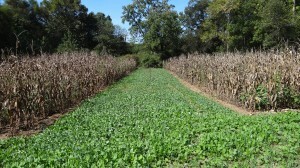 In this field we have planted food plots, mainly Whitetail Institute Whitetail Clover. The deer feed on this daily from early May through late December. We also have our honey bee hives located on the edge of this field (honey bees need a source of water). In many ways it is an ideal spot for deer to live. It is in this field that our story takes place. I have hunted here before and seen many deer including one other very large buck. 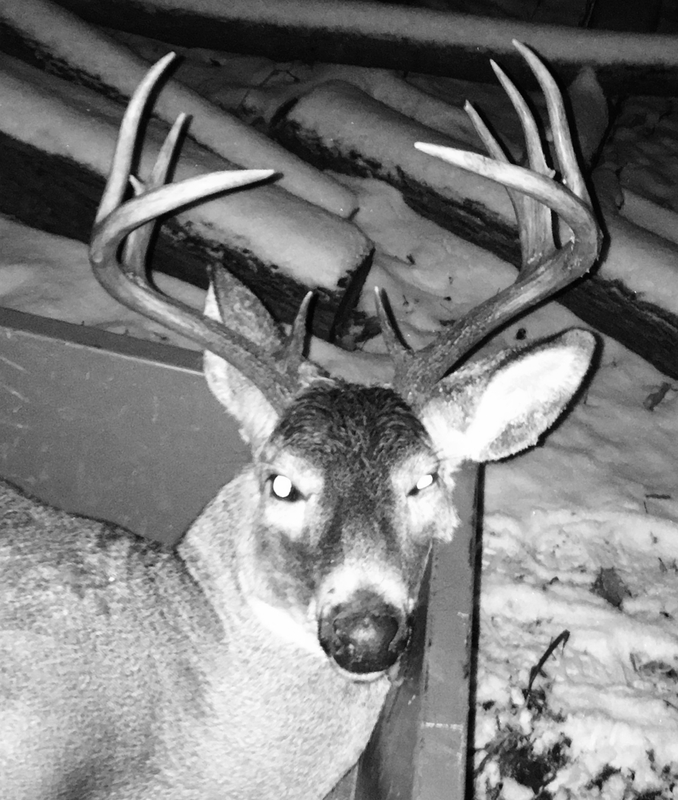 Another very large buck was shot by my neighbor’s wife, and probably a lot more came and went through the years without being noticed. They are attracted to this location additionally because does with fawns annually raise their young here. It is a good place for bucks and does to “hook up” during breeding season, which is also hunting season. I hunted this spot on the Saturday evening of the opening day of “Regular” or “Gun” season starting about 3:30 PM. You can hunt till about 4:45 this year which corresponds with sunset. My view looked out over several food plots of different ages. Looking to the west was the setting sun with the silhouettes of trees in the background. It was looking west that I started to see some movement. First came a healthy fawn into the field edge. Almost immediately a red fox approached from the opposite direction cruising the field looking for a mouse for dinner. They approached about thirty feet away from each other, had a momentary stare down and then went their separate ways in the opposite direction. Next out of the woods came a limping fawn. Something had happened to it’s front leg which made it limp. After about ten more minutes a spike buck appeared. The spike buck and the limping fawn seemed to relax, put their heads down and stared to graze on the clover. The healthy fawn kept putting it’s nose in the air sniffing for the scent of danger. The quiet was interrupted by the honking of geese flying overhead. They seemed to be circling looking for the next place to land. Twice, the flock of maybe a hundred geese rose up in the air so the setting sunlight shined through their wing feathers making them look like specks of gold glittering against the blue sky. A few minutes later a flock of ducks flew overhead much lower and I could hear the flutter of their wings against the air. I watched these three deer for about twenty minutes, sitting on five gallon bucket, when I decided to practice getting my rifle in position like I was getting ready to shoot the spike buck. I was in an awkward position to grab my gun which was leaning on a tree and then maneuver quietly to get in position to place the deer in my sites. 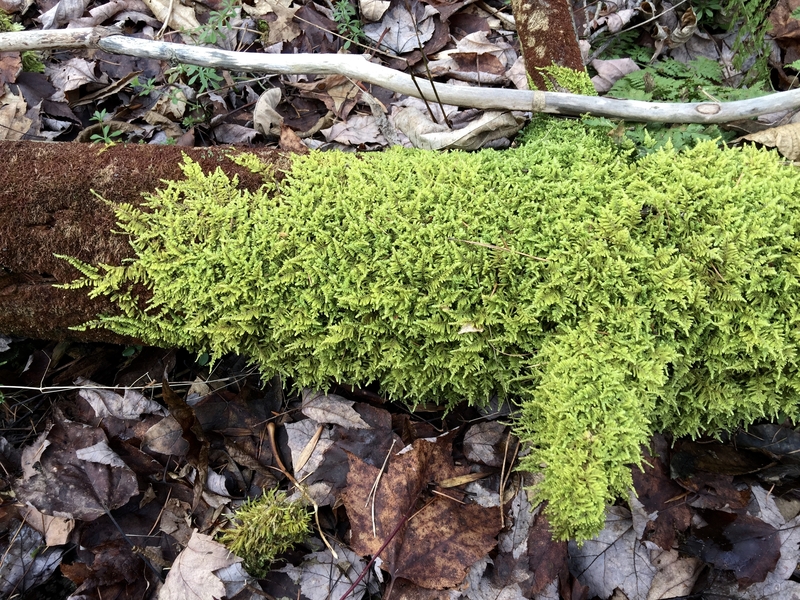 I was about halfway through this process when my jacket caught a twig, which snapped, and sent all three deer, tails in the air, leaping back into the safety of the forest. It reminded me of what I already knew. Don’t sit!! Stand and wait, ready to shoot, with gun in hand!! Sunday morning I took a long walk on the property across the road. The woods were very quiet, with only an occasional shot being fired in the distance. The caw of a crow or the chirp of a bird broke the silence occasionally. There were occasional heavy snow squalls through the morning. I found shelter behind a tree to keep from being covered with snow during the squalls. 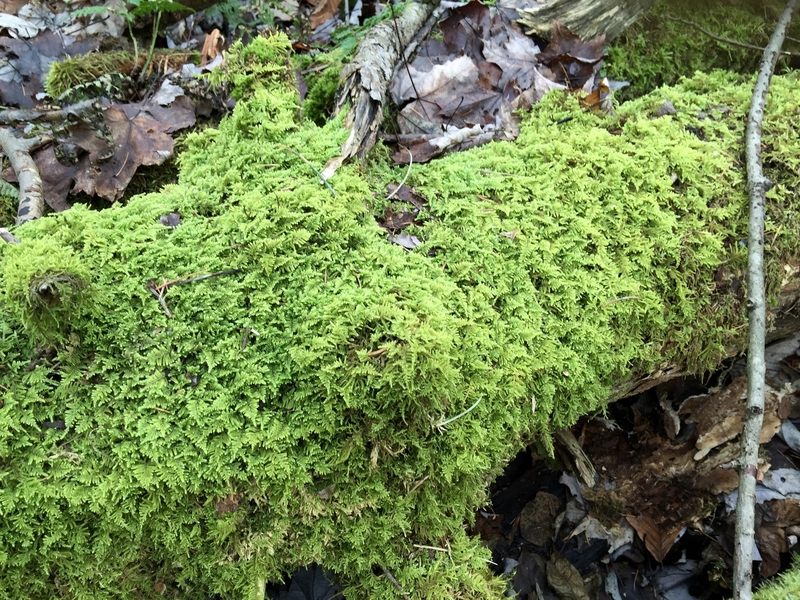 When you walk though the forest this time of year, it is a good time to put your “Forester” hat on and check the trees for those that should be harvested, those that need to be thinned and those that just need to grow. I didn’t see a deer all morning! At 3:00 I headed out back to my bucket, but did not sit on it! I hid behind a triple trunk cherry tree and waited patiently with gun in hand, standing! I watched the field through the gaps in the tree trunks. After about fifteen minutes a fawn came out of the forest and started to graze in the same spot as last night. It is always good to see some activity, so I just sat and watched the fawn graze, while scanning the rest of the field every few minutes. 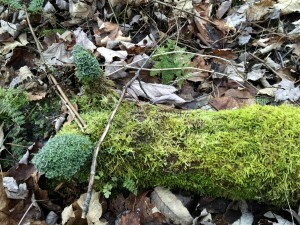 Then I noticed some movement about 150 feet further down along the same forest edge about 4:20 with the sun almost set. First a doe, then a fawn, then another fawn, then another doe and then the same spike buck as the evening before. Some of them stared to graze. 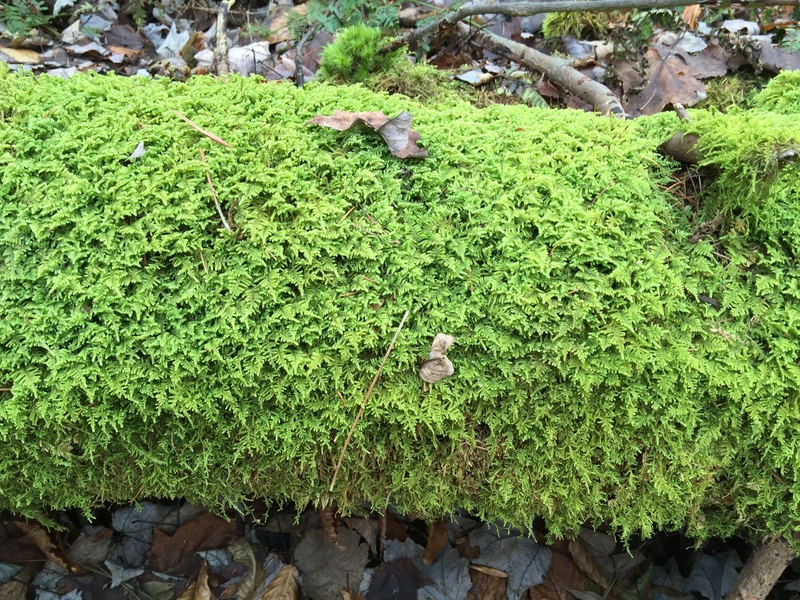 The glint of the setting sun on yellow antler drew my eyes inside the forest edge. There behind this little herd of deer emerged the large ten point buck that we had been seeing on our camera. It was beautiful! It slowly moved along the field edge gradually getting closer to me and walking broadside. This would be a perfect shot, if I could get into position and make the shot. I was shooting the old fashioned way with open sites, no scope. I lifted the rifle in between the tree trunks, cocked the hammer and released the safety. I was I little more excited than I anticipated and took a moment to calm down. Then I lined up the rear “V” site with the front “I” site and the chest of the buck. I pulled the trigger. Up and off he ran bursting back towards the woods, but I thought I detected a slight “stagger” as he took off. I walked over to where I shot him, but there was nothing, no blood, no hair, no nothing. Maybe I missed him completely? It wouldn’t be the first one I missed! I started following the tracks and noticed a few specks of blood, so I did hit him! I followed the tracks and minor specks of blood and found him expired in the woods about 200 feet from where he was shot. There was a quick walkie-talkie call to my son for help as the sun had set and it was getting dark and colder. We decided that I would start field dressing the deer while he walked up to help. Once we finished that, we dragged him a short way to one of our hiking/logging trails. Down to the barn we hiked to get our tractor started, which sometimes doesn’t like to start on cold days. It had been about 30 degrees all day. It started with a little extra cranking. We hitched up a small wagon and drove it up to pick up the deer. To clean it up, we drove it down to the house and washed it with a garden hose, so that it would be ready to be butchered. We agreed to give the deer to our neighbor the following day, so we took it to the barn to hang. Our neighbors will butcher the deer and use the meat during the upcoming year. Hanging the deer for our purposes allowed the body to cool down uniformly and helped to keep it clean and preserve the meat. We used a gambrel to this. The next day we were able to lower the deer into our wagon for delivery. The antlers on this deer, although not in record territory, will make a nice mount. We will be making a skull mount on our own. We had a conversation with another neighbor about how to do this, which appears be possible by an amateur, with a little planning and a little work. This was the first antlered deer I have ever shot. Although a minor milestone, it does feel like something has been accomplished. Hopefully, the tradition of going deer hunting with my son on opening day will continue into our tenth year. We have a great time each year regardless of whether we are successful hunters. In our community garden plot in southern California, we have planted a winter garden. This area can receive frosts or freezes, but this winter of the El Nino weather pattern is forecast to be warmer than normal, so we are taking a chance that we will be successful. 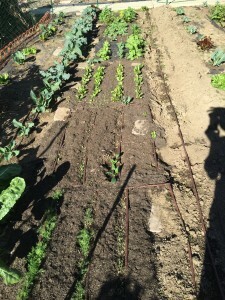 We have planted mostly cool season vegetables that should grow well in the cool winter temperatures as long as they don’t receive a killing frost or freeze. We are growing for a harvest time period of January through May. We planted most of our seeds in mid October. 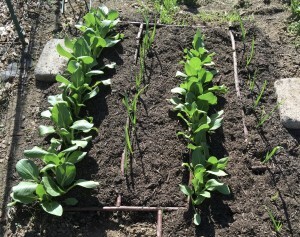 We have also planted several “batches” of lettuce, broccoli, cabbage, cauliflower and brussel sprout transplants. Transplants are available all winter in southern CA. We also planted some potatoes. In addition to our winter garden we are maintaining the perennial herbs sage, rosemary, oregano, chives, and thyme. 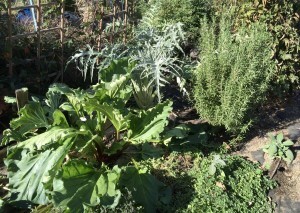 We have included in this area of the garden a few rhubarb plants and one artichoke. 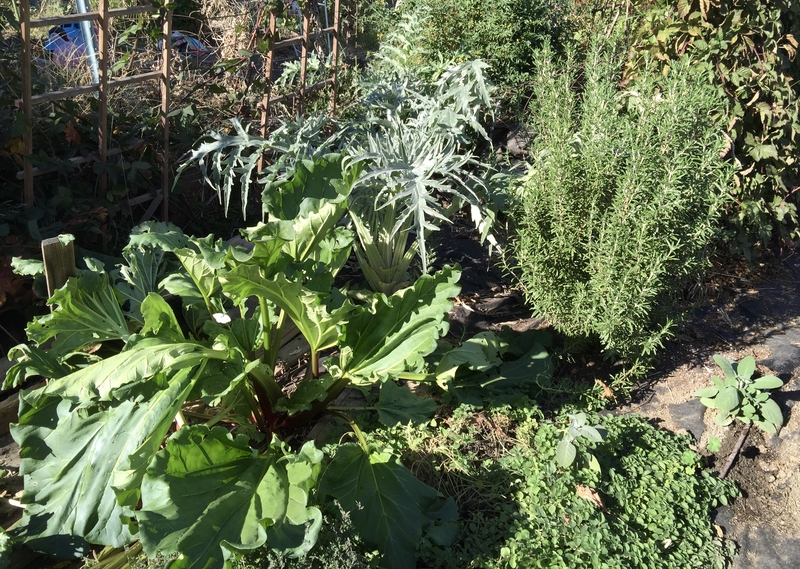 At this time the artichoke is growing rapidly and will bear the edible flower buds in the spring. 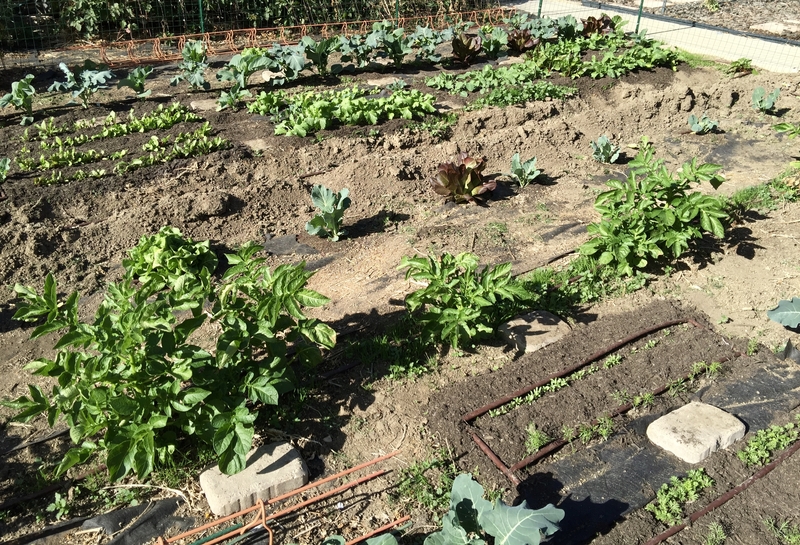 We have created seedling beds for this garden because we wanted to plant a large number of different varieties of cool season vegetables to feed just two people. Because there are only two of us, we wanted variety and to be able to harvest over a long period of time. Some of the seedlings we have planted include fennel bulb, carrots, beets, chard, lettuce, spinach, mustard greens, collard greens, onions, bok choi, garlic, dill, parsnips, parsley, cilantro, turnips and peas. 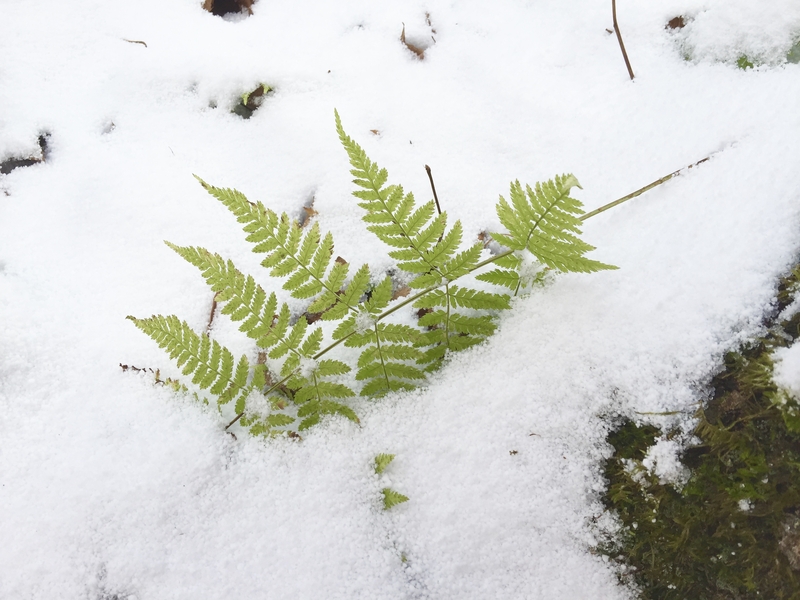 Because the temperatures will be cool especially at night, the plants will grow slowly. The abundant sunshine will encourage good growth during the short days. 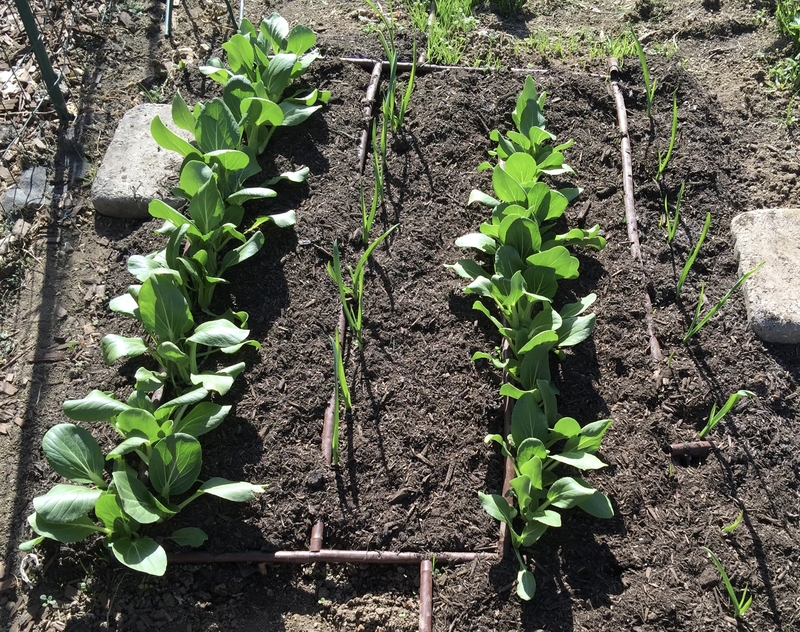 In this bed we planted garlic cloves 2-3 inches deep and seeded two varieties of bok choi in alternate rows. We will start harvesting and thinning the bok choi plants very soon and add them into a salad mix. The remaining plants will continue to grow larger and will we thinned one more time before we allow a few bok choi plants to reach maturity for a final harvest of a half dozen plants. The garlic will continue to grow until it is harvested in mid summer here in southern CA. If we still have time after the last of the bok choi is harvested we will seed in another vegetable for a second spring crop. We are hoping to plant some areas three times during the year. Hunting is More Than Hunting! There is more to hunting than hunting! Hunters spend many many hours in the outdoors scouting, observing, putting out food plots, trimming shooting lanes, clearing trails and preparing for the hunt. Many of these hours are spent in solitude in the quiet of the forest, forest borders or open fields. This is where wildlife and plant life of all kinds abound. You have to “out there” to see it, and hunters are out there! Most hunters will tell you that it is more important to be out there than it is to be a successful hunter bringing back some game for dinner, or to bring back a trophy. Walking while hunting is also great exercise. The Fall and early Winter are good times of the year to be observant because the leaves are off the trees and you can see things then that you cannot see in the Summer. We wanted to share some photos we took on one morning of hunting. 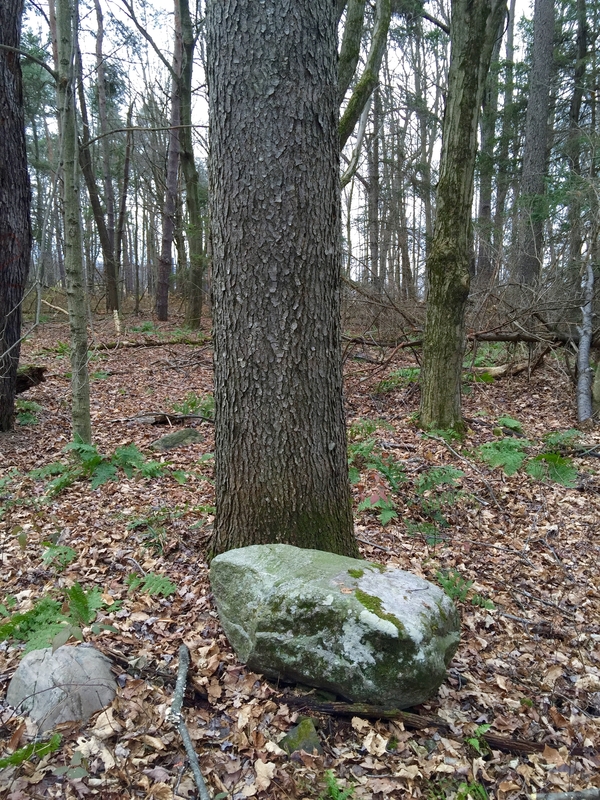 This large rock is a relic of past farming activity. 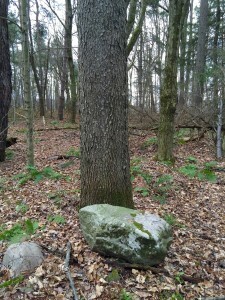 There was a cluster of rocks in this place in the forest. 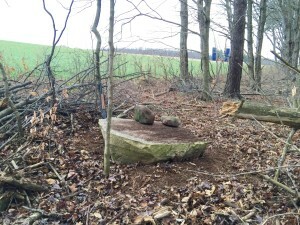 Farmers moved large rocks to the edge of their field to get them out of the way of the farm equipment. At one time this area would have been the edge of a field. This particular rock is perfect to sit on and take a rest. The tree behind it is a lumber type cherry tree that is used to make fine furniture. This tree is currently larger enough to be harvested, but it has a long way to grow before it is past it’s prime and we will let it grow for at least another decade. We used to sit on this rock at the edge of the field many years ago. I have looked for it recently but have been unable to find it. 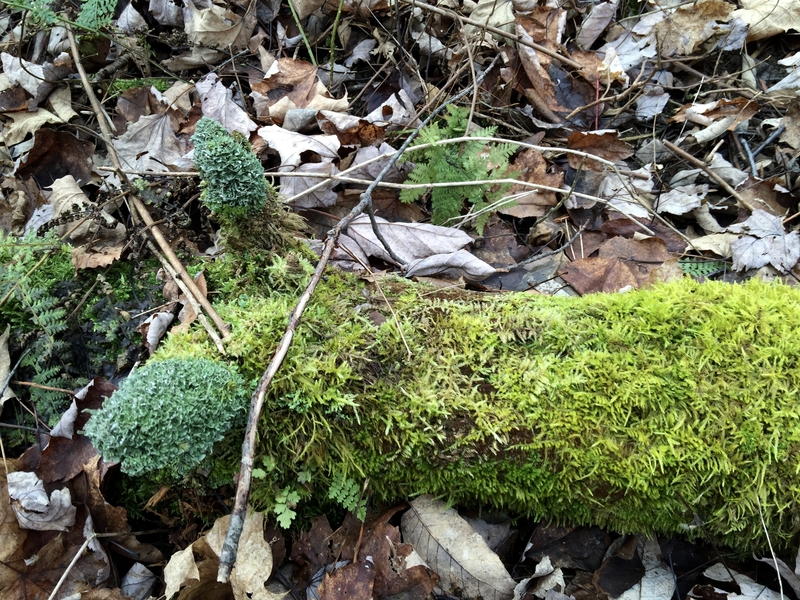 On this day, I searched more intensely and discovered it buried beneath a fallen tree, a lot of branches and years of accumulation of fallen leaves. A soil had started to form on top of the rock. The rock is unique for it’s flat surface. Now that it has been re-dicovered and cleared off, we will try to come here more often to, sit, listen and observe.